When Prachatice (38 miles from Budweis) celebrated the canonization of its native son, John Nepomucene Neumann, in 1977, secret police were in attendance. Our city guide said many young people had no idea who the man was or why he was important. But many of the older people knew, and they attended the celebration despite the political intimidation. Today, 22 years after the Velvet Revolution ended Communist rule in this country, this Czech town’s pride in its native son is palpable and it underscored the significance of our visit, the climax of our Neumann Bicentennial Pilgrimage. 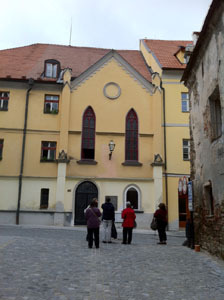 There’s a Neumann chapel in Kostel Svatého Jakuba (Church of St. James), at the site where Neumann was baptized. Commemorative art includes a portrait of Neumann in his bishop’s robes, a small statue at a front altar, and a colorful mural created by schoolchildren depicting his episcopal seat of Philadelphia. His birthplace today is a hospice. 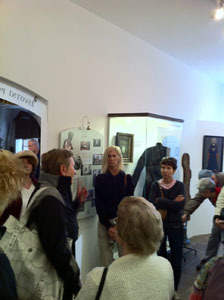 And the city’s historical museum houses a special exhibit room covering his early home and family life as well as his missionary work in America. Even the burial site of Philip and Agnes Neumann celebrates their son. Nestled against a wall in a cemetery well above the town, the grave notes John Neumann’s episcopal position in a mural and a gilded footstone inscription. At Mass in the simple chapel — despite a chill in the air and a cat meowing during the readings — we pilgrims experienced a spiritual warmth and depth of feeling. 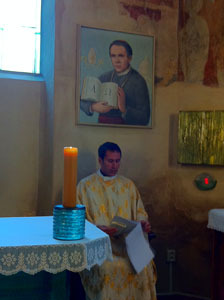 Monsignor Bastress placed a relic of Neumann on the altar, and Father Daniel presented a list of special intentions for healings of soul, mind, and body. Father Daniel likened Neumann to the description of Barnabas in that day’s reading from the Acts of the Apostles — a good man, filled with the Holy Spirit and faith, encouraging others in firmness of heart. The happy result, outlined in the reading: "And a large number of people was added to the Lord." Neumann overcame many obstacles in pursuing his vocation, Father continued, and on occasion felt a deep sense of despair. In our own moments of darkness, he said, Neumann is someone we can turn to for understanding and intercessions. Neumann was not a martyr, nor one of the early Church Fathers or a similarly spectacular personality. In fact, he was dismissed as too ordinary by one of those studying his life for evidence of sanctity. Such a judgment misses what Neumann embodied — the holiness of living out our day-to-day lives with unwavering trust and hope in God. In declaring Neumann’s heroic virtue, an early step toward canonization, Pope Benedict XV said, "For true activity does not consist in mere noise, it is not the creature of a day, but it unfolds itself in the present, it is the fruit of the past and should be the seed of the future." May the attention to Neumann this bicentennial year be the seed to renewal of faith in Czech Republic, especially among those young people wondering who Neumann is and why he’s important. Our day was not yet done. We had one more stop before reaching Prague, our final destination. Svata Hora (the Holy Mountain) arises outside Pribram, about 62 miles northwest of Prachatice. Housing a miraculous statuette of the Blessed Virgin, the basilica with chapel has been a place of pilgrimage since the 1600s. Redemptorists were entrusted with its care from 1861 to 1950, and again beginning in 1990. The sanctuary comprises a terraced ballustrade akin to a fortress protecting a small Baroque church with outdoor and indoor worship spaces. 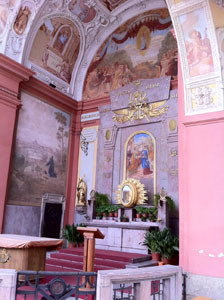 The colors of the outer chapel have been faded by the elements, but the inner chapel glitters in gilt and silver, boasting a new altar and ambo. On the ballustrade, wall and ceiling, murals tell the history of the complex and of 100 major miracles — largely dating to the 1600s and 1700s. Once again we were invited into private Redemptorist quarters for refreshment. The offerings: European or American coffee and kolaces — or kolaches as they’re called in Nebraska. To my delight, these country-style fruit-daubed pastries were much like the ones my grandmother used to make!